274 pages | 4 B/W Illus. Offering new insight on Mexican American culture and families, this book provides an interdisciplinary examination of this growing population. Contributors from psychology, education, health, and social science review recent quantitative and qualitative literature on Mexican Americans. Using current theories, the cultural, social, inter- and intra-personal experiences that contribute to the well-being and adjustment of Mexican Americans are examined. As such the book serves as a seminal guide to those interested in moving away from the dominant deficit model that characterizes the majority of the literature. To ensure consistency and accessibility, each chapter features an introduction, literature review, summary, future directions and challenges, policy implications, and references. Contributors review current education and health care policies and research that impact this population with the hope of guiding the development of policies and interventions that support well-being and adjustment. -Normative and strength based perspective on Mexican American families. -Generational perspective that is common among Mexican American families. -Multidisciplinary review of the values, beliefs, practices, identities, educational resilience, and physical and mental health issues for a deeper understanding of this growing population. -Focus specifically on Latinos of Mexican Origin with a highlight on the cultural, social, interpersonal, and intrapersonal experiences that contribute to well-being and adjustment. -Empirically grounded resource to guide the development of public policy and intervention approaches that support the well-being of families of Mexican origin. Part I provides an historical and demographic overview of Mexican Origin peoples in the US, the development of ethnic identity in these children, and theories for conducting research with this population. 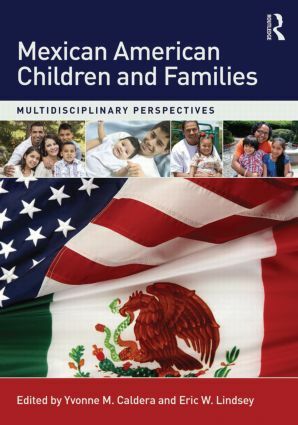 Part II highlights the family context in which Mexican-Origin children develop including characteristics that promote school readiness, values that promote successful co-parenting, and how Mexican American children learn by observing and pitching-in. The section concludes with a discussion of the concept of space and its role on the socialization of Mexican American children. The issues and challenges that Mexican American children face as they move through the US school system are examined in Part III. These chapters highlight the role that language development and bilingualism play in school success, the ways in which teachers can support the learning and development of these children, and the impact of parents’ involvement in children’s schooling. Part IV examines mental health care systems including ways in which providers can improve participation and the quality of services, the factors that influence Mexican American parenting and the role these play in their children’s mental health, and the impact of acculturation and enculturation in the mental health of adolescents. Physical health is the focus of Part V.　Here the Hispanic Paradox, the occurrence of better health outcomes in immigrants compared to their U.S. born counterparts, is explored. These chapters attempt to disentangle the role that culture plays in the paradox, the benefits associated with traditional Mexican dietary practices and ways in which nutritionists can utilize these to promote healthier eating, informal health care practices that are traditional in the Mexican heritage and the factors that influence their usage, and the role of culture and behavior on physical health including maternal and infant health. The book concludes with recommendations for future directions for research. Ideal for advanced students, researchers, policy makers, and practitioners in human development and family studies, psychology, sociology, social work, education, and community health interested in Mexican Americans, this book serves as an excellent resource in graduate or advanced undergraduate courses on Mexican American culture, (Latin) Mexican American/Chicano or cross-cultural studies, cross cultural development, diversity, or race and ethnicity. Knowledge of social science or developmental theory is not assumed. Yvonne M. Caldera is Professor of Human Development and Family Studies at Texas Tech University. Eric W. Lindsey is Professor of Applied Psychology at Penn State University – Berks Campus.